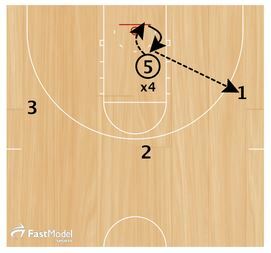 This drill was detailed by Coach Randy Brown. Randy has continued his passion for the game of basketball well beyond his 30+ year coaching career. An 18 year NCAA Division I head and assistant coach he knows the difficulties of coaching and assists coaches of all levels around the world to help improve our ability to teach the game of basketball the right way. This post player skill development drill is posted on the Fast Model Play of the Day Site. Click on the link to check out a lot of other great drills and plays! This drill starts with three perimeter players and 5 with the ball 10 feet from the backboard. X4 starts on 5’s back to create contact on the rebound. 5 underhand tosses the ball off the backboard the attacks the ball with two hands as X4 creates contact on his back. After rebound 5 throws outlet pass to 1 on wing. On pass from 1 to 2, X4 has to touch baseline before defending 5. 5 takes post up to the defender and seals him. If open, 2 passes to 5 who catches and gets shot inside. If 5 is not open 2 passes to 3 on left wing. On the pass defender has to touch baseline before defending 5. 5 again takes post up to defender for seal, catch and score. Drill can be run from left block to right, or right to left.